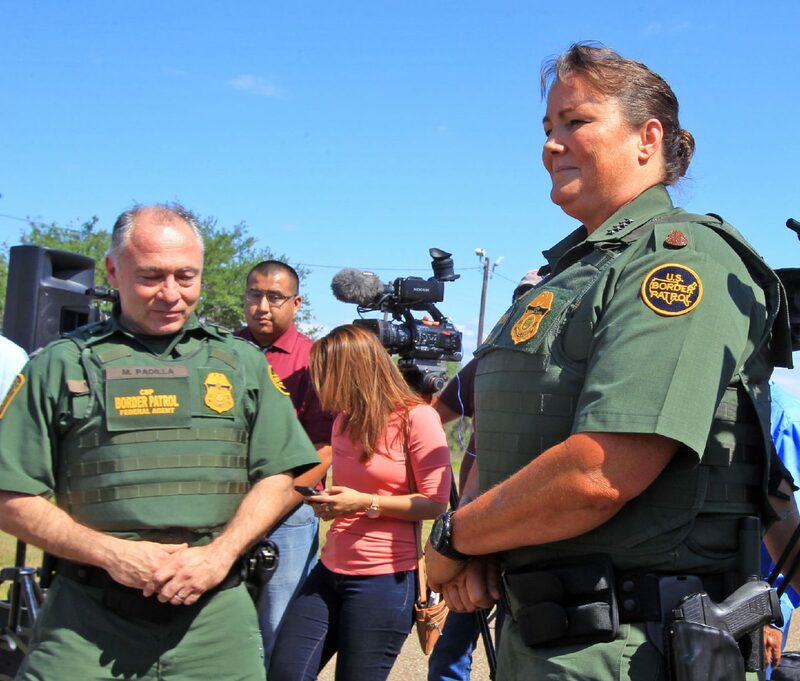 U.S. Border Patrol Acting Chief Carla L. Provost meets with members of the media with RGV Sector Chief Manuel Padilla by her side at the U.S. Border Patrol checkpoint Thursday, April 26, 2018, south of Falfurrias. 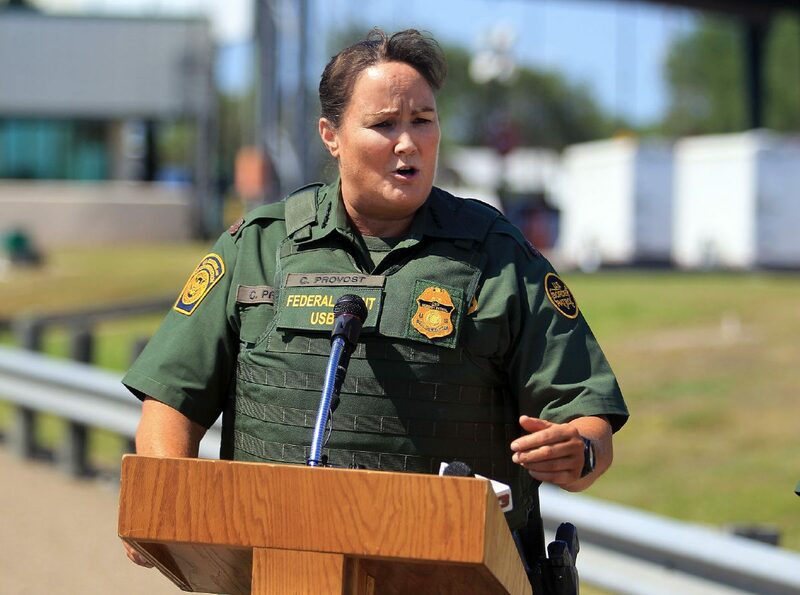 FALFURRIAS — With the checkpoint as her backdrop, the U.S. Border Patrol acting chief addressed the media to give a summary of the state of the border. On the heels of the deployment of National Guard troops and confirmation that government officials are preparing to perform land surveys in advance of new border wall construction, acting chief Carla L. Provost met with agents here. Provost, in what marks her first visit to the Rio Grande Valley, spent nearly the majority of the day meeting with agents and touring different areas north of the checkpoint. During her visit Thursday, Provost, who was named Border Patrol acting chief last April, hopped aboard a bus along with RGV Sector Chief Manuel Padilla to view the current construction around the checkpoint, as well as areas considered “operational challenges,” due to the impact smugglers have in the region, Border Patrol officials said. 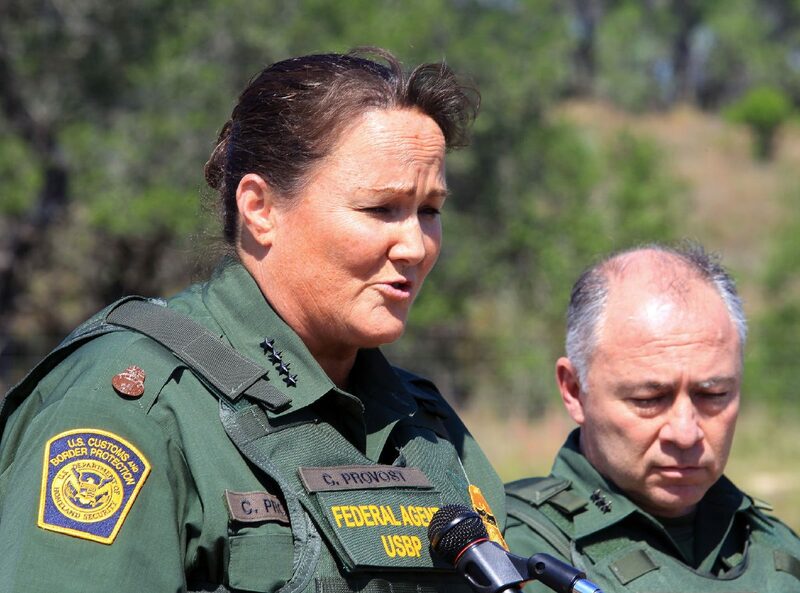 U.S. Border Patrol Acting Chief Carla L. Provost meets with members of the media at the U.S. Border Patrol checkpoint Thursday, April 26, 2018, south of Falfurrias. Provost also visited Border Patrol personnel north of the checkpoint in Brooks County. She said the trip was crucial to her understanding of the area. 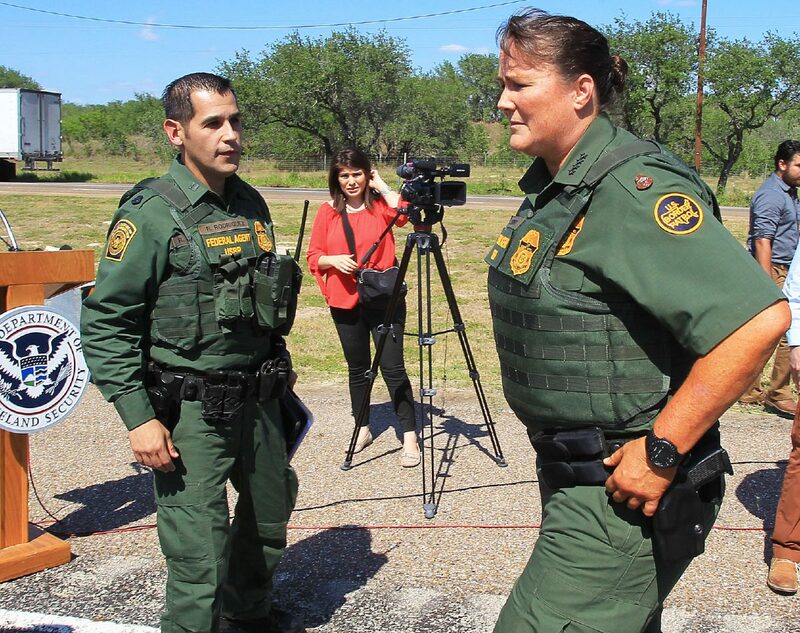 Her stop at the checkpoint comes a day after she visited with Starr County leaders at the Rio Grande City Border Patrol station, as well as a tour of the river near Border Patrol’s area of responsibility in Roma. As part of her tour, Provost boarded a helicopter that flew over McAllen to Rio Grande City, Border Patrol officials said. 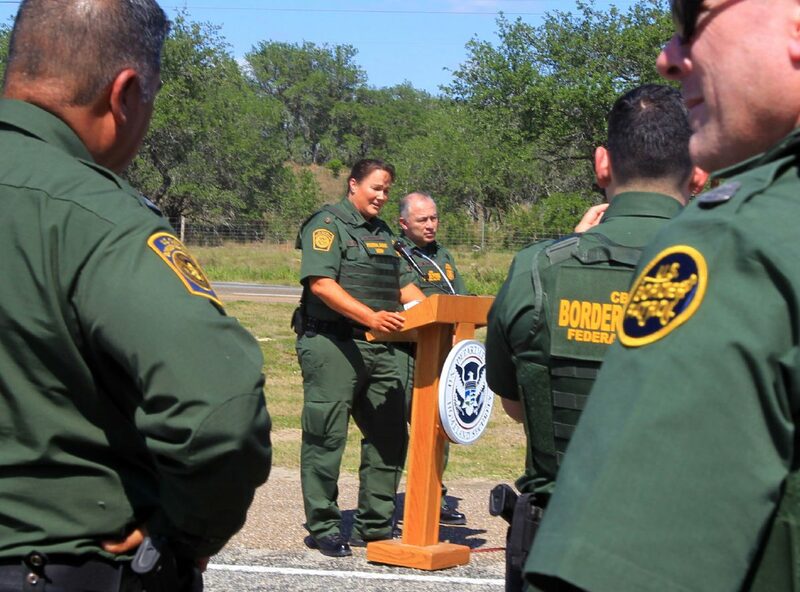 Border Patrol’s work with local, state and community leaders stood out to her during this visit, she added. “I’m very impressed with the relationship down here, as I’ve said before, that’s key to our success in securing the border,” the acting chief said. Leaders in the western edge of the Valley met with Padilla and other officials Monday regarding the most recent border wall construction plans for the area — specifically the 8 to 12 miles of fencing expected to be built in Starr County as part of the Omnibus bill that passed at the end of March, and which provided the Trump Administration with $1.57 billion for physical barriers and associated technology along the Southwest border. This includes 90 miles of border wall system that spans the U.S.-Mexico border from San Diego to the RGV sector in Texas. That meeting comes a week after officials with the U.S. Department of Homeland Security announced that U.S. Customs and Border Protection and U.S. Army Corp of Engineers officials would begin issuing notices to landowners in both Hidalgo and Starr Counties. The notices, which will be sent “immediately,” will ask permission from landowners for government officials to conduct “Rights of Entry for Survey,” or (ROE-S), in order to commence the real estate, environmental and design processes for the border infrastructure projects that were funded in CBP’s 2018 fiscal year plan. Starr County landowners are expected to receive the notices in about three weeks, according to Roma Mayor Roberto Salinas, who was in attendance during the Monday meeting between local leaders and Border Patrol officials. In recent weeks, Border Patrol and CBP officials have visited various sectors along the U.S.-Mexico border, including a stop in Santa Teresa, New Mexico, where 20 miles of primary vehicle barrier area was replaced as part of the first new construction project to get underway after the passage of the spending bill. Provost, who briefly addressed the media, is a longtime Border Patrol agent who began with the federal agency more than 20 years ago, and had worked in places such as Douglas, Arizona, El Paso, and El Centro, California. Among the specific challenges Provost mentioned was the high percentage of apprehensions — 40 percent — attributed to the Rio Grande Valley Sector. Provost said the Border Patrol has a “new standard,” of securing the border and reaching operational control — adding they have room for improvement in that area. Before ending her brief conference with the media, which lasted less than 15 minutes, Provost was asked about Border Patrol’s method for tracking assaults on agents. This is in response to a recent article that reported Border Patrol’s use of statistics showing sharp increases of assaults on agents in the RGV sector were inflated. The article, written by Debbie Nathan and published by The Intercept earlier this week, cited a CBP public affairs spokesperson who said one February 2017 incident involving seven agents in the RGV sector accounted for 126 assaults alone. This was due to how they tally the assaults — multiplying the number of agents, seven, with six “perpetrators,” and multiplying that by the three “projectiles,” used in the incident, which led to a total of 126 assaults for that single incident. A former CBP internal affairs director who worked at the agency until about 2014 was quoted in the article stating that was not how assaults were tracked in the past. Provost didn’t shy away from the question, stating she had confidence in how they tracked the assaults of their agents.